All wheel drive has become an increasingly popular option, and for many it is the deciding factor in their choice of car. From AWD hatchbacks and AWD saloons, to AWD SUVs and AWD sports cars, the range of vehicles that offer it is vast. But what is AWD, and why is it useful? What Is All Wheel Drive? All wheel drive gives the driver increased confidence on any road surface and in all weather. The system spreads the power from the engine to all four wheels, instead of just two, providing increased grip. From loose gravel surfaces in mid summer to icy winter roads, all wheel drive cars offer greater stability and control.The system is always active and works continuously without the need for the driver to switch from two wheel to all wheel drive. All wheel drive isn’t just safer, its superior traction delivers more dynamic handling and greater composure when engaged in more spirited driving. AWD systems are controlled more by electronics than by mechanical parts and are fitted primarily to road cars. It is designed to ensure optimum traction while driving on all different road surfaces in all kinds of weather. By contrast 4WD systems are more complex, and are equipped with more mechanical parts. They are fitted to vehicles designed for extreme off-roading, enabling them to negotiate boulders, traverse deep water and climb steep hills. 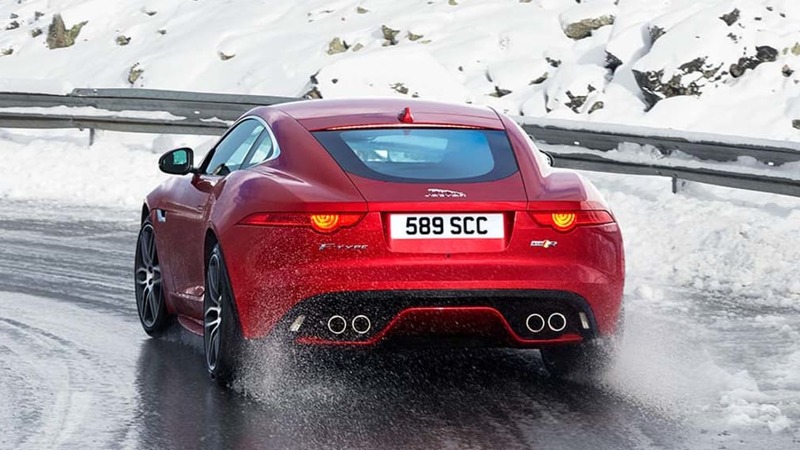 Every car in the Jaguar range is available as all wheel drive. Our flagship luxury saloon, the XJ, is offered with Torque-On-Demand AWD. All our other cars, the F‑TYPE, XE, XFand the F‑PACE, are fitted with our innovative and unique Intelligent Driveline Dynamics AWD. Both systems are engineered so that in normal driving conditions, 90% of the torque is committed to the back wheels. This ensures that every one of our AWD cars retains Jaguar’s dynamic rear wheel drive feel for a more enjoyable driving experience. When the systems detect that more traction is needed, they seamlessly transfer as much torque as is required to the front wheels to improve stability. The systems are constantly working to find the optimum balance of traction and performance, so the moment they establish that additional traction is no longer required, power is returned to the rear axle. Jaguar AWD with Intelligent Driveline Dynamics (IDD) is unique among all wheel drive systems, developed exclusively for the F-TYPE, XE, XF and F-PACE. While other all wheel drive systems become active only after the car loses traction, Jaguar’s AWD with IDD is predictive. If it calculates that grip will imminently be lost, it pre-emptively shifts torque to the wheels that have better traction to maintain control and composure before it happens. Beyond just improving all weather driving on lower traction surfaces, Jaguar’s AWD systems enhance driving performance in the dry. Whether you’re in the F‑TYPE, XE, XF, or F‑PACE, and whether you’re on an open country road, or out on the track, you’ll feel the benefits of Jaguar’s AWD through every corner. Jaguar’s advanced Torque‑On‑Demand All Wheel Drive system is offered on the Jaguar XJ. Its highly responsive technology is designed to deliver torque to the wheels that have the most traction for an uninterrupted, refined, agile performance. Maximum grip and control for confident handling in all weathers, on all surfaces.